In the northwest corner of the square you’ll find the Gothic Revival-style Old South Church, a National Historic Landmark. 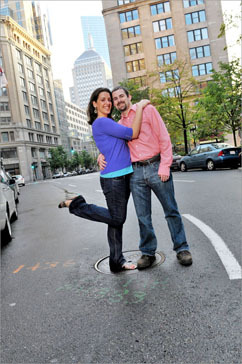 Have your engagement photographer take a portrait of you and your man beneath the arched portico at the main entrance or at the top of the bell tower, the church’s trademark feature, using its stunning view of the Back Bay area. Adjacent to the Old South Church you’ll find the famous Boston Public Library, whose inner courtyard will provide you with a perfect spot for your engagement photo shoot. First, you and your fiancée can pose for photos atop the balcony looking out onto the courtyard. Then, descend to the courtyard and take photos beside the glimmering fountain or beneath the arches that line the inner corridor. Your next stop will be The Museum of Fine Arts, a magnificent example of Neoclassical architecture located on Huntington Avenue. Here, you and fiancée can relax on the expansive verdant lawn in the foreground of the structure as your engagement photographer goes to work. You can also pose on the steps leading to the entrance of the museum, or out on the second floor balcony beneath the towering Corinthian columns. 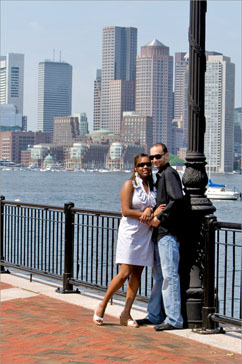 Other great photography locations within Copley Square include Trinity Church and The Fairmont Copley Plaza Hotel. For the couple that loves the outdoors, Boston’s Larz Anderson Park and Arnold Arboretum are two fantastic engagement photography locations. Located in Boston’s Brookline neighborhood, Larz Anderson Park is a favorite of tourists and locals, alike. Have your engagement photographer capture some candid moments between you and your fiancée as you take a leisurely stroll across the park grounds. 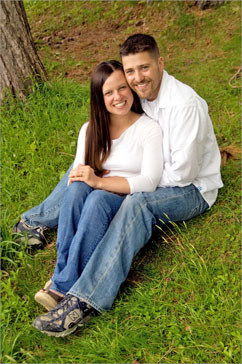 Visit the park’s famous “Temple of Love,” a cozy little chapel that will serve as the perfect location for an intimate engagement portrait. You can also take photos beneath any of the park’s large shade trees, or kick back on the lush green grass (you might even consider having a private picnic!) The park’s large, tranquil pond is intersected by a stone bridge - another great place where you and your fiancée can pose for your engagement photos. Only a mile away from Larz Anderson Park you’ll find the Arnold Arboretum, one of Boston’s proudest treasures. During the fall season, the tree collections within the arboretum display some of the most gorgeous foliage, whose vibrant colors will do wonders for your engagement photos. Walk across the park and enjoy all the stunning greenery that surrounds you as your engagement photographer takes photos. As you approach the waterfront, you and your fiancée can take a seat on any of the wooden benches and gaze out towards the water (it’s particularly beautiful in the late afternoon hours). For other great engagement photography spots within the park, check out the pink cherry blossom trees, as well as the miniature bridge that crosses over the pond. Among the many universities that Boston houses, Boston College contains one of the city’s most picturesque campuses and is a great place to have your engagement photography session. Gasson Hall is the university’s most iconic building and its stunning Gothic architecture will provide a perfect backdrop for your engagement photos, as will the finely landscaped courtyard in the foreground on the building. For more Collegiate Gothic architecture, visit the ornate John J. Burns Library and the Recitation (or Tower) Building. Both structures are approached by neatly paved walkways and are surrounded by large shade trees, wooden benches, and verdant lawns. If you and your fiancée want to find a more natural setting for your engagement photos, talk a short walk to Chestnut Hill Reservoir, which borders the southeastern edge of campus. This pristine reservoir is surrounded by a 1 ½ mile loop that you and your fiancée can take advantage of for a relaxing promenade. This seemingly secluded area just outside the Boston College campus will provide a gorgeous natural setting for the conclusion of your engagement photography session.